Leanne Wheeler, a US Air Force veteran once deployed to Desert Storm, challenged the Philip Morris tobacco company today and the $17 million the company has spent in Colorado to dissuade voters away from Amendment 72. If passed, Amendment 72 will increase the cigarette tax by $1.75 a pack and the tobacco tax on products such as cigars and chewing tobacco by 22%. The collected funds would be distributed to increased healthcare for Coloradans with lung diseases, and to cessation and education programs about the dangers of smoking. Mental and healthcare for Colorado’s 500,000 veterans would also receive the funding. 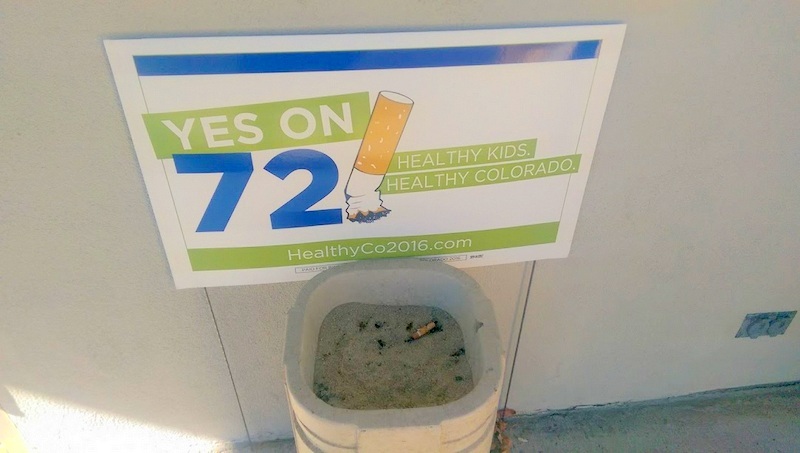 Over 100 organizations have voiced support for Amendment 72 including Children’s Hospital Colorado, the American Heart Association/American Stroke Association, and the American Lung Association. The United Veterans Committee, a nonprofit coalition of 50 chartered and federally recognized veterans service organizations in Colorado said that they organized the event with the intention of clearing any misconceptions of their support for the Amendment. Of the $315 million expected to be collected by the tax in the first year, 14% or $48 million will go to underfunded mental and healthcare for veterans. Veterans in need of mental health and substance abuse care would benefit from increased funding to services for suicide prevention, treating PTSD, depression and anxiety disorders. Other veteran’s organizations in support include Disabled American Veterans, Mile High Military Officers Association of America, and Rocky Mountain Navy. Education programs to reduce smoking are also proposed in Amendment 72. It’s estimated that kids smoke 7 million packs of cigarettes a year. The Centers for Disease Control and Prevention recommendations for tobacco education for both youth and adults led to the $54 million of the revenue collected from the tax to go education, cessation, and prevention.